1. 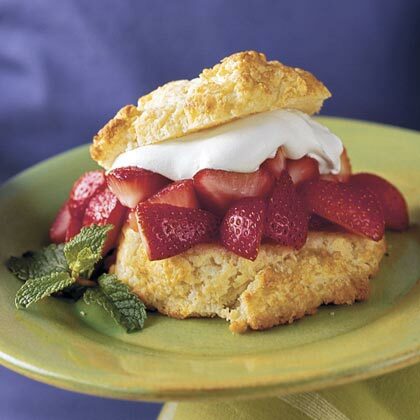 Combine strawberries, 1/2 cup sugar, and, if desired, almond extract. Cover berry mixture, and let stand while making biscuits. 2. Beat whipping cream at medium speed with an electric mixer until foamy; gradually add 2 Tbsp. sugar, beating until soft peaks form. Cover and chill . 3. Combine flour, remaining 1/4 cup sugar, and baking powder in a large bowl; cut butter into flour mixture with a pastry blender or two forks until crumbly. 5. Bake at 450° for 12 to 15 minutes or until golden. 6. Split shortcakes in half horizontally. Spoon about 1/2 cup berry mixture onto each shortcake bottom; top each with a rounded Tbsp. chilled whipped cream, and cover with tops. Serve with remaining whipped cream. Garnish, if desired.